I was asked by these clients to design a home for their very steep riverfront lot. When I met them on their property, even I was surprised by how steep it really was. But the mountain river below was so beautiful. It was large and made lots of sound. It was obvious to me this home must open up to the river. But how can you do this when it is so far down below the house, down an extremely steep bank? There were a few other factors I needed to consider. The couple had a limited budget and they loved craftsman style homes. Craftsman style homes were popular just over 100 years ago. This was part of a movement against anything manufactured by machinery. A celebration of hand made crafts and natural materials. That sounds great for the mountains except for one problem, most homes in this style were designed for level suburban lots. So I worked on a compromise design, one that included what they liked about the craftsman style, into a home designed for this steep river front property. 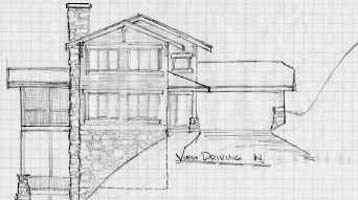 This sketch shows the view when approaching the driveway of this home. The carport is on the right, with a retaining wall to hold back the steep bank. The lower level glassed area is the living room. This area sticks out from the house to provide plenty of view downhill. The two level covered porch on the left was placed so as not to block the view from the living room. That is very important when the view is downhill. Most people want the deck off the living room, but the deck and railing would block the view there. So I slid the deck away from the view, but where it is just as well connected to the house. Notice how this design only requires a level spot the width of the driveway. That saves a fortune in excavating costs, and makes the home fit the property so much better. Another way I helped reduce the budget was designing the extra bedrooms to be downstairs. While this might seem unusual to many, it makes the home much less expensive to build. These bedrooms have access to the view of the river and the lower level of the covered porch. The dotted line shows how this area recesses into the hill. Everyone who designes homes has projects fall through. The county and the neighborhood association could not agree on what they would require for this home, and the clients gave up. Even though this rough sketch is hard to see, it has been one of the most popular homes on this web site, my little "compromise craftsman."